For weeks, the smoked salmon from my in-laws was taunting me every time I opened the freezer. “Eat me. Just defrost, cube and eat me — you’ve never had a problem with that before,” it called out. Somehow, I managed to resist the bait; thankfully, once upon a time it didn’t, or else this fictitious conversation wouldn’t have occurred. While perfectly good on its own, I had plans to do something a little fancy with it this year. Nothing so over-the-top to hide the flavors — what a shame that would be, it is the best smoked salmon I’ve ever tasted — but something that would complement them instead. My idea, and the source of my willpower: blini. Now here’s the tricky part, I’d never had a one before. However, I had visions of bite-size, party-ready, more-pancake-than-crêpe-esque blini dancing in my head — perhaps caused by an over-indulgence in Christmas music over the years, but more likely due to this Google images search. While the first versions were deemed too buckwheat-y, too fluffy, too dry, too large, this one (finally) was just right. As for the crème fraîche, any brand will work here. Though, if you can get your hands on a tub of the award-winning one by Cowgirl Creamery, you’re in for a treat. It’ll set you back about $6 for an 8 ounce tub, but has the potential to be the only one you buy for a year or so if you use it as a starter for another, significantly less expensive batch — more on this in a soon-to-be posted recipe, I promise! It can be found at the various Cowgirl Creamery Retail Locations (Pt. Reyes Station, San Francisco Ferry Building and Washington D.C.) and some Whole Foods Markets (their Cupertino location recently began stocking it). I imagine that these elegant-yet-simple bites would make quite the splash at a New Year’s Eve party when paired with a glass of bubbly, but they are certainly appropriate for any time of the year. Whisk together warm milk through honey in a small bowl; allow yeast to proof slightly (about 5 minutes) while you get the dry ingredients ready. In a small bowl (2 quarts), whisk together millet flour through black pepper. Once the milk mixture is slightly frothy, whisk in the olive oil and egg. Immediately whisk wet ingredients into the flour mixture, beating until smooth. Cover top of the bowl tightly with plastic wrap, place in a warm, draft-free location to proof for about 1 hour, or until at least doubled in size. Once batter has risen, preheat a griddle or steel crêpe pan (uncoated, not non-stick) over medium-low to medium heat (typically use the lower temp setting for thinner pans). Whisk batter to deflate. Pour about 1 teaspoon batter onto the griddle for each blini (they will spread slightly) and cook just until lightly golden on the underside — 30 seconds – 1 minute. Flip and cook the other side until lightly golden — about 30 seconds – 1 minute more. Transfer to a cooling rack, stack once cooled to room temp. Repeat with remaining batter. Do Ahead: Blini may be made about an hour or two before assembling without a huge loss in quality. Transfer cooled blini to a storage bag, removing as much air as possible, and store at room temperature. Once blini are cooked and cooled to room temp, top each with about 1/4 teaspoon crème fraîche and about 1/2 teaspoon Smoked Salmon (more or less to taste). Arrange 2 – 3 sliced chives on top and serve immediately. ¹ Please do not substitute sour cream! How to D.I.Y. : click here. 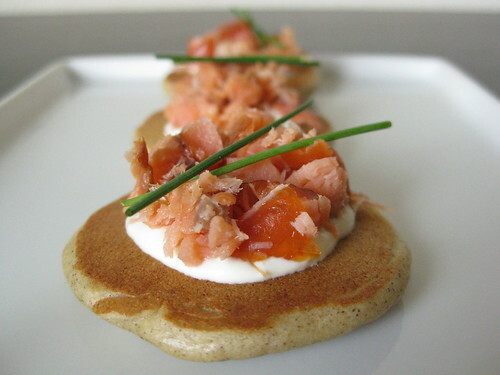 I looove blini with smoked salmon – sounds amazing! Wow. These blini are beautiful. Lizzy Do: Thank you — I had so much fun assembling them. Hope you enjoyed the smoked salmon! Kiri: I’m now hooked on them, too — thank you! chezsasha: Thank you so much for sharing your family’s version of blini — they sound quite tasty, and less of a wait versus a yeast-leavened version like this one.